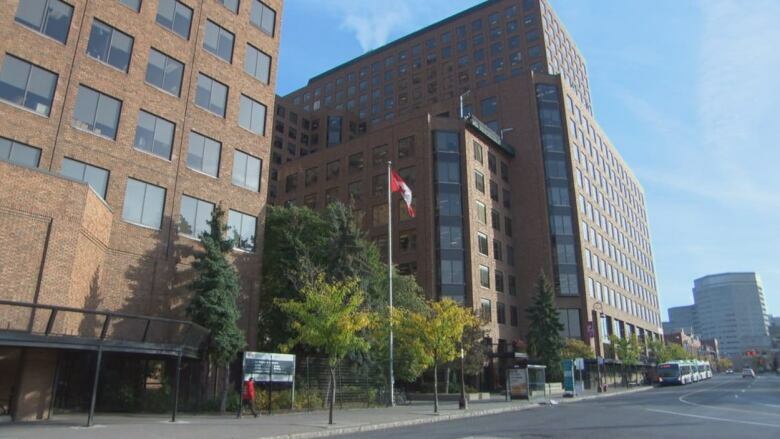 A prominent federal government complex in downtown Gatineau will have its brick façade removed and replaced with black and silver aluminum panels, a dramatic new look approved Thursday by the board of National Capital Commission. The bricks currently covering Terrasses de la Chaudière have twice fallen off in the past two decades, posing both a safety risk and a liability for Public Services and Procurement Canada (PSPC), according to a report by NCC staff. An earlier plan included rooftop gardens and solar panels, but PSPC and the designers found the budget wouldn't allow for them. The complex has also been plagued by poor air quality, forcing the relocation of hundreds of employees, but this project is separate, NCC staff said. Gatineau Mayor Maxime Pedneaud-Jobin was enthusiastic about the recladding, noting the complex was in need of a facelift. With the Zibi development being built nearby, he said the whole look of the area will change in the coming years. The NCC approved a new landscaping plan for the complex last year. PSPC is expected to seek a building permit for the project by July. The government complex appears 'impenetrable to the public' in its current form, according to the NCC staff report. With more glass, they'll appear more welcoming. The new exterior of the complex will include cross-laminated timber panels to give the building a 'distinctive Canadian personality,' NCC staff say.